Tomorrow is the much anticipated #SLBloggersBash and I could not be more excited! I am meeting Kat from Laydey Katabella at King's Cross and then we are going to meet some other bloggers before heading to the event at One Alfred Place. The event has been organised by an amazing blogger, event organiser and lovely lady called Scarlett and co-hosted by Search Labs. I have no doubt that it has been months in the planning and it has finally all come together! To celebrate the event, I asked if I could interview Scarlett so that other bloggers could understand how she became the person she is today and she kindly agreed. "Anyone can achieve anything with the right mindset and motivation!" I've wanted to be a journalist and a writer since as long as I can remember, so when I started applying for work experience at 17, I realised that I probably needed an online showcase of my writing portfolio to stand a chance among a sea of more experienced candidates. Initially, I didn't actually know that what I'd produced was even a blog. I just thought it was a website I wrote things for, however then I started chatting to others that did the same and was pleasantly surprised at the friendly community blogging is. Essentially, my motive for blogging is because I'm passionate about writing, it's therapeutic and I think that has stood the test of time as I've never kept anything up for as long as I've blogged. It's coming up to 4 years now! 2. Do you feel like you've come a long way since you started? Most definitely. I've actually deleted the majority of my first posts as they were hilariously awful, however everybody has to start somewhere I suppose! I now know how to structure a post and realise that if you're going to write something and promote it, it has to actually offer something to the reader rather than telling them something they already know. I treat the reader as a friend rather than patronising them (which is how I think my first couple of posts may have come across). The great thing about blogging is that it is an ongoing practice of your writing abilities. 3. When did you decide to start putting on events? I think it was around 2013 when I realised that although I had a small pool of blogging friends, I wanted to branch out and get to know other like-minded writers and photographers, those who spent their spare time uploading content to their blogs had something instantly in common with me - so I thought it would be interesting to create a place for such individuals to come together. The first one I ever did was a bloggers lunch in London, with about 10 attendees. It was informal - and fairly mismatch but I really enjoyed organising the whole thing and watching people enjoy it, so I wanted to do something on a larger scale the next time. 4. Which event are you most proud of so far? And why? Probably the #BloggersFestival in September, as it was my largest to date and I absolutely loved the venue! I always fret beforehand that no-one will turn up and it will be just me, my boyfriend and my parents sipping 100+ cocktails and munching on the canapés, looking forlornly out of the window, however luckily - people do turn up, and there's no better feeling than witnessing people enjoying an event that you've put together! 5. What would you say is the best thing about being part of the blogging community? Having an instant group of friends to turn to is definitely the biggest bonus. Although I often have blog envy, it's never malicious and I've never experienced any bitchiness or competitiveness, it's all friendly and if you ask a question - you'll get tonnes of online friends come back to you with helpful answers. 6. What advice would you give to newbie bloggers? Find your reason for blogging, write it down and if you're ever lacking in motivation - remind yourself why you started. I think blogs are interesting because they're an extension of someone's personality. We're all voyeuristic, we love being nosey and looking into other people's lives, so blogs allow for this - and that's why we read them. Make sure your personality is injected into your blog - that's your niche! Oh, and make sure you have a clear 'Contact' page - some blogs I've looked at (when inviting to events) haven't even included their email address or social media handles - and then wonder why people aren't getting in touch! 7. How important is networking/socialising for bloggers? I think it's definitely a factor if you want to expand your blog somewhat. IRL networking is definitely a bonus but if you live miles away from London (where the majority of the action happens) you can still socialise really well with the community on Twitter! 8. What is your favourite social media platform? And why? Twitter. It's simple, instantaneous - and you don't have to make your tweets look pretty all the time. Although I love Instagram, I am put off a little by how contrived everything is. How the borders, filters and brightness has to be 'just so' in order for you to connect with others and engage properly. I love photography, but words are my favourite - and Twitter is your best option for this! 9. Do you have certain blogging/work goals thay you would like to achieve? If so, what are you closest to achieving? I'd love to say I have a 5 year plan for my blog - which I have written before and then scrapped, however at the moment - I just want to try and balance it successfully with Uni work. When I graduate, I really want to try and blog full-time for a couple of months, see how far this takes me - and go from there! 10. Finally, if you could say anything to your younger self then what would it be? Exams aren't everything. Although I loved my education and my secondary school, they placed such a heavy focus on exams that I became the most anxious, nervous person who believed that my life would end if I didn't achieve an A grade. From a maturer perspective, I know that they want these grades to boost their rankings in national averages, however at the time, I thought it was the bee all and end all of being successful. Education is important and I am proud of my grades, but don't focus on them as an indicator of how well you'll do in life. Anyone can achieve anything with the right mindset and motivation! Thank you to the lovely Scarlett for agreeing to be interviewed, she is such an inspiration to other bloggers and I can't wait to meet her tomorrow. 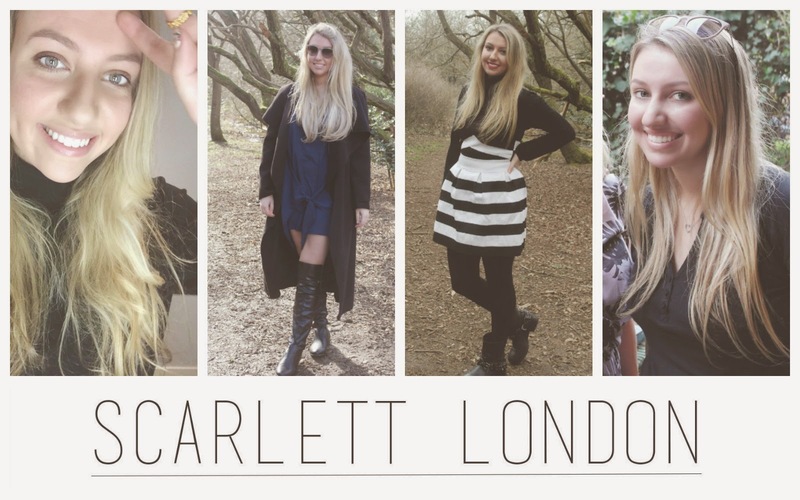 Please check out Scarlett's blog called Scarlett London and her events twitter HERE. Can't wait to hear about how the event went - Will def. be at the September festival this year! Hope you have a great time at the event! It must be such hard work to plan and organise events, it's great of Scarlett to it!